MusicBee won't mess with any of your files unless you change settings or make direct changes. I suggest you give it a try and see what happens. I wouldn't even worry about using the iTunes library unless there's data there you care about it. If it's only the playlist, make sure itunes is storing then as m3u files and you can scan them into MusicBee as-is. However, I suggest you test with just one or two, maybe exported copies, until you're comfortable with it. MusicBee will re-save playlists in it's own format (mbp) unless you change the library settings, but you can export them again as m3u any time. Or even have it automatically keep an m3u copy for you. Bingo! Sorry I missed your earlier post. Tagging Tools > remove Tags did the job. Any suggestions how I can avoid this process in the future? Thanks for looking into it, Steven! Is there a place to see how music bee works? I have been keeping my library in iTunes, but using Virtual DJ to play the songs. I DJ once a week. I am not a technical person by any stretch and really don't want to mess up my playlists and database, BUT I got get out of ITUNES. Latest issues, as a result of their last update, is all the songs that I cut in Audacity are now showing up as 789:59:13 and iTunes could care less. Got it back by installing an older version. And if you want to delete the tag, use Tools> Tagging Tools> Remove Tags command and delete the first Album Artist tag. As I said I don't think it has anything to do with MB. MB just shows what's already tagged. 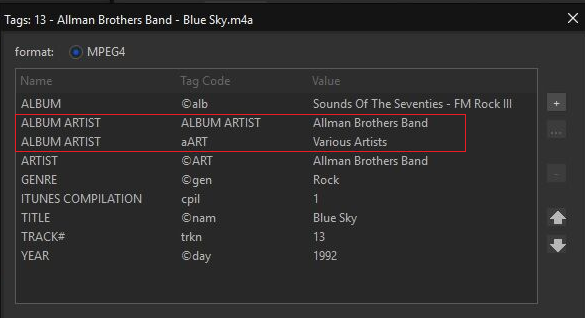 What program wrote the first Album Artist tag in your workflow? I think the issue i noticed is probably unrelated and there wasnt anything unusual in your settings.